The Rover fiber dispenser is a fiber feeder solution specifically designed to be mounted on virtually any volumetric concrete truck. The Rover fiber dispenser is available in single or double bobbin units and the motor speed can be easily regulated to achieve different fiber feed rates. • EASY TO INSTALL: The Rover fiber dispenser is compact in size making it easy to maneuver and install where needed. • EASY TO LOAD & USE: There is no need for fiber bags to be kept in the truck – freeing up space. • HIGH CAPACITY: Each bobbin provides approximately 42 pounds of fiber. • EXTREMELY ACCURATE: Ability to change the fiber dosing rate to meet job specifications. • BETTER QUALITY CONTROL: Automatic fiber chopping and dosing allow for better control over the fiber supply which reduces the stress and confusion about how much has been added. Get the right amount every time! • LOW MAINTENANCE: Saving time and money for years to come. 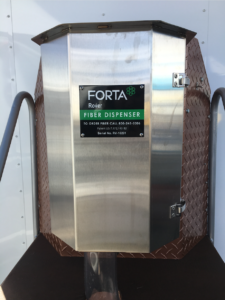 For use with Volumetric Concrete fibers provided by FORTA! !